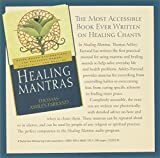 Thomas Ashley-Farrand’s Healing Mantras Thomas Ashley-Farrand Mantras are sacred sound syllables from the Vedic tradition. For thousands of years, they have been used to promote inner healing, spiritual development, and beneficial effects in the world around us. Thomas Ashley-Farrand’s Healing Mantras CD gives listeners access to more than 20 mantras, and teaches how to intone them with perfect precision (a key to their effectiveness). Covers the theory, origins, pronunciation, and practical applications of mantra practice. Detailed study guide included.